Beyond the growth in the number of students vying for spots in undergraduate programs, admission officers saw students with higher academic achievements and who also embody Emory’s commitment to discovery, engagement and leadership both in the classroom and in the community. Emory received applications from — and offered admission to — students in all 50 states. Admitted students represent 75 countries by citizenship, speaking more than 79 languages either as their first language or at home. About 29 percent of the admitted domestic students to Emory College are from underrepresented minority groups, including 36 students from Puerto Rico. "The depth and diversity of this year's record-setting applicant pool showcases Emory's reputation as a home for students and faculty dedicated to both academic excellence and making transformative contributions to the world," says President Claire E. Sterk. "We look forward to welcoming these students to Emory's community of committed, engaged scholars and future leaders in a world that faces drastic changes." Emory University offers two starting points for prospective first-year students: They may apply to enter Emory College of Arts & Sciences on the Atlanta campus or to study for their first two years at Oxford College on Emory’s original campus in Oxford, Georgia. After the sophomore year, all students choose to complete their undergraduate degree on the Atlanta campus through Emory College, Goizueta Business School or the Nell Hodgson Woodruff School of Nursing. 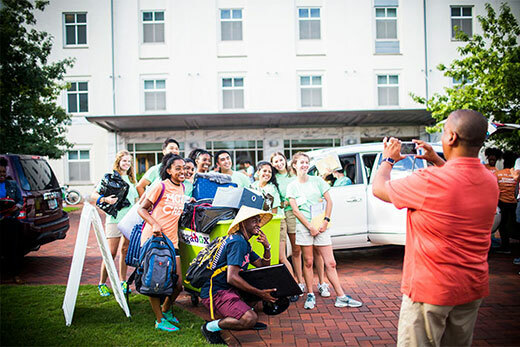 “As a leading research university with a deep commitment to the liberal arts and interdisciplinary scholarship, Emory University offers students the opportunity to discover and explore their academic passions in a culture of innovation and inclusion,” says Dwight A. McBride, provost and executive vice president of academic affairs. Emory College and Oxford College both saw increases in applications for the third year in a row. Emory College offered admission to 5,103 students, an 18.5 percent admission rate. Oxford College has admitted 4,144 students. About 58 percent of students applied to both campuses. This year’s applicants recorded increases in both unweighted grade point averages as well as overall test scores. For instance, the median test score (based on SAT scores and ACT equivalents) for students admitted to Emory College was 1500, meaning half of them were above a score considered in the 99th percentile nationally. The median unweighted high school GPA of admitted students was 3.91. The breadth of student experience was also evident in their application essays, Latting says. The increase in both the number and the quality of applicants is thrilling for leaders at Emory College and Oxford College alike. “It is incredibly gratifying to see students of such high caliber apply to Emory University, and the potential that the admitted students represent for our community of scholars,” says Emory College Dean Michael A. Elliott. “Their collective accomplishments tell us something about the value that the world sees in our work as a liberal arts research university." Latting attributes the record number of applicants in part to a broader trend of would-be college students seeking an education that will help them make a difference. Emory’s reputation for academic rigor and commitment to serving society make it a good choice for students who are especially diligent about using their education to benefit others, he says. Emory also has made financial commitments to make the university a viable option for every student who is admitted, regardless of the ability to pay. Regular decision notifications were released online March 22 through applicant portals. Admitted students have until May 1 to decide to enroll.